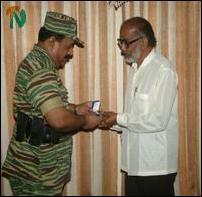 LTTE leader, Mr. V.Pirapaharan, granting an award to Mr. Gopalaratnam. [Photo: LTTE]. “Mr. Gopalaratnam’s writing style, his presentation of opinions and his choice of titles for his works attracted readers’ minds and stimulated their thinking. His creations were succinct, in an easy-to-read style, and included all facets of an argument. “Through his writings, Mr. Gopalaratnam made all people focus on the Liberation struggle and rendered great service to the Tamil nation. “Since Mr. Gopalaratnam has deep talents needed in a writer—in particular, the ability to connect the future to the present--his every piece of writing is a living piece. 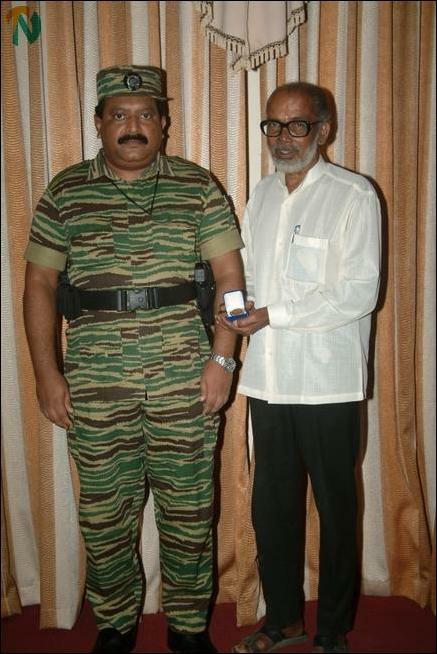 LTTE leader and Mr. Gopalaratnam posing for pictures after the award. [Photo: LTTE].